Now I'm sure that when you all think of me, you say "That Unsinkable, what a fashionista." You go on and on about my fierce fashion choices, my impeccable taste in designer clothing, and my unique way of putting pieces together to create a bold statement. Or, you just think "That Unsinkable, she matches today." If you, like me, are usually oblivious to fashion trends because you have much more important things to do like watch Biggest Loser and change 40 diapers a day, then join me as I tell you the blogs that I frequent so as not to look like a total dweeb in Mom Jeans. And if I do indeed look like that, please don't tell me. I'm enjoying myself. 1. The Budget Fashionista - Good articles, practical suggestions and unlike most budget fashion blogs, she and I have similar ideas on what "affordable" means. Meaning, not a $90 pair of uber trendy shoes I'll wear once. Just because Christian Louboutin made ones just like them for over $1,000 does not mean $90 is budget. Bring on the Payless, Friend. 2. The Budget Babe - A lot of pictures and a lot of examples of both good and bad ways to wear trends like vests, booties, and even (kill me, because while I would never wear them, they look cozy) legwarmers. Yes, legwarmers are back. 3. 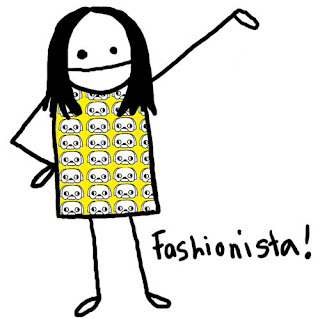 The Frugal Fashionista - This site is one of the more impractical ones, but I still like it. If you find yourself liking a particular celebrity outfit, odds are you can find a budget inspired one on here. They take the designer clothing and then find cheaper replicas from stores like Gap and Forever 21. It's also a good site to learn how to build an outfit around a particular item. Because you know I'm all about that. 4. Fab Sugar - Fab is much less about budget and much more about style. This is wear you see the runway trends and the designer bags detailed. There are some articles about how to get the look for less, but mostly about appreciating the real deal. 5. The Cheap Chica - I'm relatively new to looking at this blog, however, it seems to be geared more to individual deals on items, as opposed to giving advice or suggestions. It's probably a good site to check every few days to see if she has found a deal on something you've been wanting for awhile. If I had followed my own advice I would have snatched this sucker up while I could have. As you can see, all of these sites are pretty much geared to not spending much money and finding cute clothes. I'm trying to find my individual fashion feet after a baby making season a lifetime many moons of wearing clothes that didn't fit me, physically or personality wise. So, I'm looking around, seeing what I like, and trying new things. What about you? Any place you go to get inspired? Or you know, to just look at bad clothes and laugh? I've had the chance to put on some of the best of the best labels in the past...including some super posh evening gowns and honestly, I couldn't be happier in just a plain 'ole t-shirt and blue jeans. (probably from Khols or JCPenney's) although, lately I'm into wind pants...ah, for elastic waistbands! I love your style...you've got the mommy groove going on! remember, flip-flops always ROCK any outfit! :) wanna do lunch friday? I'm excited to read these blogs! I don't have any that I read, so these will be a great place to start. I'm struggling to find my style now that I'm not working and am now a mom. I feel like I need to dress differently from the Juniors section, but I'm not ready to look that grown up yet. Hm...we'll see...Thanks! I watch "What Not to Wear." I LOVE it, not just because the people on there are far more pathetic than I am fashion-wise (thank goodness someone is!) but because they show how to put outfits together, what kinds of accessories and shoes work, etc etc. Plus the hosts are sarcastic and funny and the people on the show always come away looking ten times better, no matter how sad they were before. And I totally understand what you mean about finding your own style after babies - that's where I'm at right now, too. I've found that light-weight jackets in different cuts and colors are genius - I'm becoming a layering fanatic. for the record I think you have very found your fashion feet for sure!! Speaking of, I feel a shopping trip in the near future...let me know when there is time that works for you! Thanks for the links. I'm looking forward to reading them. Must avoid Mom Jeans.